Unique or Cool Features: Coffeen's introduction on "why" she made this book (very passionate and I can totally identify). Following this are some fun (yes, I love to learn) pages on History and Evolution of Tacos, Taco Fillings, Toppings, and even recipes for homemade tortillas and one of my favorite things in the whole book- a recipe for Folded Taco Shells. As in the crispy corn shells. Yes, I've made them before just using tongs and hot oil, but she gives a great tutorial on making a "form" of sorts out of foil (which is ingenius- why didn't I think of it). 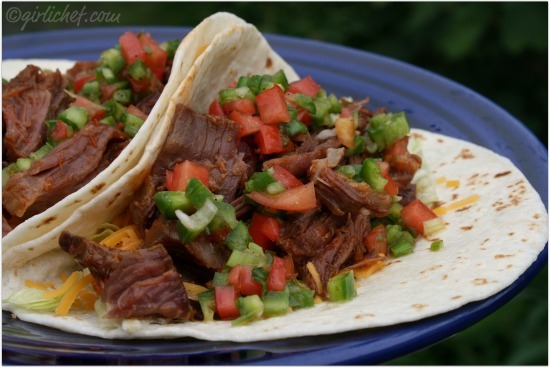 There is also her Top 10 Tips for Perfect Tacos, Tools and Equipment for Best Tacos as well as Ingredient Essentials and Mexican Food Definitions. My Thoughts/Review: Loved it! Of course, I've been a taco fan my whole life, so.... But there are tons of unusual and inventive combinations scattered throughout more traditional-style recipes in this book. There's more than just the traditional Mexican and Southwest flavors in here (although there are plenty of these, too). From soft tortillas to crispy to rolled to layered to dessert...and even some tasty beverages to wash them down with. Taco lovers unite (and add this tasty book to your collection)! Heat a large, heavy pot or Dutch oven over medium-high heat. Add oil and then brown beef on all sides. Meanwhile, mix beer, picante sauce, and brown sugar in a small bowl. When beef is browned on all sides, pour in beer mixture, scraping up the fond (bits from the bottom) and bring to a boil. Cover, reduce heat to low, and simmer gently for 2-3 hours, or until meat pulls apart easily. Remove meat from pot and shred. Pile onto warm flour tortillas with lettuce, cheese, and jalapeño relish (and a bit of the cooking juices, if you wish). Combine jalapeños, onions, and tomatoes in a bowl. Toss with oil and vinegar until everything is well coated. Season to taste with salt and pepper. Serve right away, or cover and refrigerate for up to 2 days, stirring occasionally. about the author: Kelley Coffeen is a cookbook author, food consultant, and restaurateur who enjoys the flavors of the American southwest and Mexico. Her creativity in the kitchen has resulted into 3 cookbooks, and 10 years of television cooking experiences filled with food styling and culinary demonstrations. Kelley enjoys entertaining and volunteering in her community. She lives in Las Cruces, New Mexico with her family. This is my kind of book! Love, love, love tacos!! What a great cookbook! Tacos are the best and this sounds delicious! 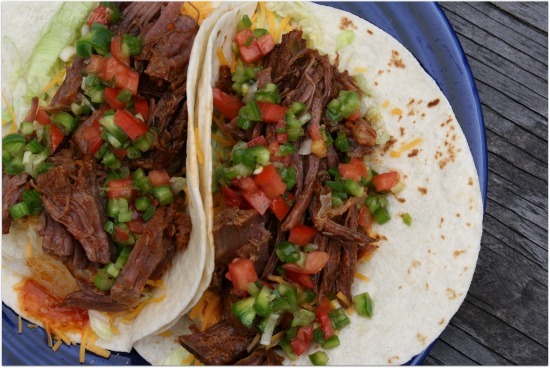 Your tacos look AWESOME! Love the relish too. wow this sounds like a great resource for when you have taco shells on hand and are bored with regular old taco filling! I can't believe there are so many taco recipes! I must read this book! I couldn't help by notice you reviewed and love this cookbook too! I loved it so much that I featured three recipes from it on my blog last Summer. 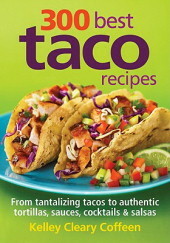 It's such a great source of taco recipes...one of my favorite cookbook finds of last year! !